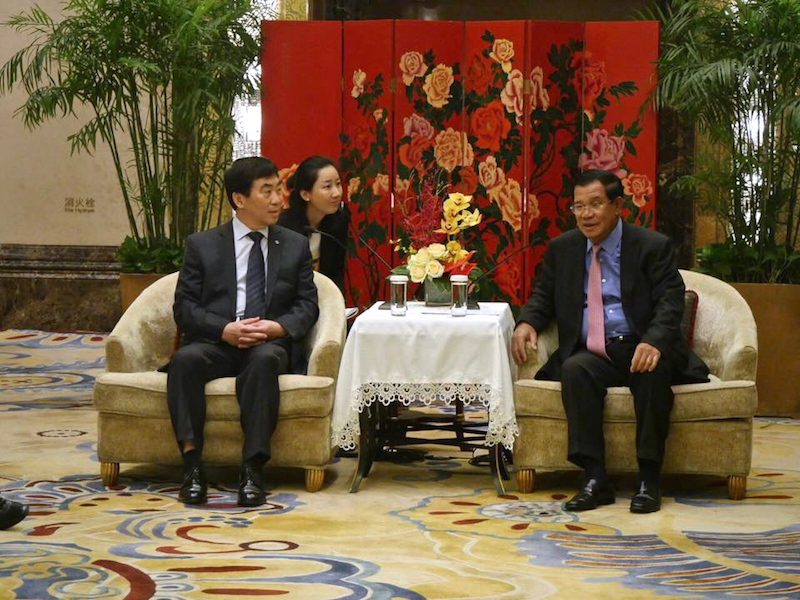 (Left) Prime Minister Hun Sen meets with chairman of China Huaneng Group, Cao Peixi, photo posted to his Facebook page. A long-anticipated hydroelectric dam in Stung Treng province is set for completion in September, Prime Minister Hun Sen announced on his personal Facebook page, touting the contentious project’s lack of societal and environmental repercussions, a claim environmentalists quickly rebutted. During a visit to Beijing before a summit on China’s Belt and Road initiative, the premier discussed the 400-mega- watt Lower Sesan 2 dam with Cao Peixi, chairman of China Huaneng Group, the Chinese company developing the project, according to the Saturday post. The cost of construction, in conjunction with Kith Meng’s Royal Group, was estimated at more than $870 million in 2013. (Right) Prime Minister Hun Sen meets with (Left) Cao Peixi,chairman of China Huaneng Group, photo posted to Prime Minister’s Facebook page. In response, however, Maureen Harris, Southeast Asia program director of NGO International Rivers, said the announcement was misleading. The dam is expected to displace 5,000 people and significantly disturb the fisheries upon which millions of people rely. “The Lower Sesan 2 dam is predicted to have major environmental impacts, threatening local ecosystems and people’s food security in Cambodia as well as in neighbouring countries,” she said in an email. The dam “blocks both the Sesan and Srepok rivers, which are critical channels for migratory fish species from the Mekong River traveling to spawning grounds upstream,” she said “It is expected to deplete fish stocks in the Lower Mekong Basin by nearly a tenth. “This alone is a huge environmental impact,” she said. She also cited predicted changes to water flow that would upset the ecosystem and agricultural development as far south as the Mekong Delta in Vietnam. Puth Khoeun, 38, a village representative in Sesan district’s Srekor commune, described the announcement as a ruse to hide the problems the dam will create. Among thousands of families evicted from the area to make way for the flooding of the dam’s reservoir, Mr. Khoeun said about 100 had rejected government compensation in land and cash and had remained there. And while economists say the dam does have potential to cut excessive electricity costs in Cambodia, they say the resolution is not so cut and dry. But Mr. Khoeun said his community had no interest in access to electricity from any source.